A wooden chopping board is the choice of a true chef. Combine a chopping board with storage containers and it’s ideal for fast food preparation. It turns a countertop into a kitchen workbench. It makes cooking easier by keeping foods organized and freeing up counter space. 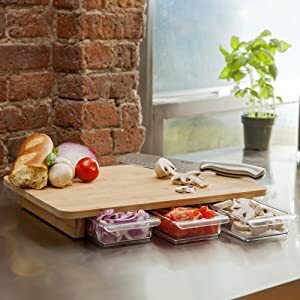 Organized cooks are happy cooks, and they are thrilled to find that there are two top quality wooden cutting boards that offer storage drawers. We’ll review them both here in this article. Let’s start by reviewing the Frankfurter Brett, a cutting board that is anxiously awaited by the culinary world. The Frankfurter Brett is a chopping board system dreamed up by two brothers who love to cook. One is a chef, the other is an industrial design student. They started with the idea that the world needed a better cutting board, so they created an extensible kitchen workbench. But as we mentioned, the Frankfurter Brett isn’t only a cutting board, it’s a whole food preparation system. Following are more features that make it uniquely useful. Inside each of the three sizes of the chopping board (the Mini, the Mono, and the Phoenix) is a a system of extensible, powder-coated steel brackets. These brackets pull out of the board to support storage containers of various sizes. They are very strong, and even come in various colors so you can customize your system as you like. The storage bins that fit into the extensible brackets are called “gastronorm.” They are the standard containers used by caterers. Depending on your need, you can place one large bin or multiple smaller ones on both the sides and front of the worktop. Just imagine how convenient this is! Instead of using an odd assortment of cups and bowls littering the countertop as you chop, you have a ready-made setup organized for you. Sweep peels and refuse into one bin. Fill another with the food you’re dicing. Drop used knives or spoons into a third. Everything is modular, so you can change it around depending on your food prep needs. In case you’re curious about container sizes, the Frankfurter Brett can handle a variety. For example, while the display container on the back (more on that below) can only be a maximum of 2.55 inches deep, the containers on the front and side brackets can be any depth you like. Just position the workbench so that the front and sides line up with the edge of your countertop. Even better, you can use containers of varying widths. If you only want one wide container on the side instead of two narrower ones, no problem. The front can hold up to three at once. You read above about the brackets and the containers on the sides and front of the board. But there is another handy part to the Frankfurter Brett. It has an angled display bracket at the rear. You can rest a cookbook or tablet on it. You can put other containers in it to hold items like spices or utensils. Then everything is within reach and within view as you cook. The largest of the Frankfurter Brett kitchen workbenches is the Phoenix. It’s also the heaviest at 26.45 pounds. The weight is due to the resin-coated concrete base frame. This strong, heavy frame keeps the worktop, or cutting board surface, from sliding around on the counter. It has anti-slip silicon rings on the bottom for extra grip. You may be hesitant to invest in the Frankfurter Brett because you don’t like to cut meat and vegetables on the same chopping board. With the Phoenix, it’s not an issue. You can literally flip the worktop over inside the frame and use the other side of the board to cut. We love the Frankfurter Brett kitchen workbench. It’s lovingly designed down to every detail for master chefs and people who love to cook. See it in action in this demo video here. If you can’t wait to get your hands on one, you may also enjoy the Quirky Mocubo Cutting Board. We’ll take a look at it below. If you love the idea behind the Frankfurter Brett kitchen workbench food preparation system, you may find that the Quirky Mocubo makes you happy too. It is a bamboo chopping board with slide-out drawers. Quirky Mocubo uses bamboo for their cutting surface. It’s a tough wood that resists knife marks. It doesn’t absorb water easily, so it’s not likely to swell and warp out of shape. Although it isn’t dishwasher-safe, it’s lightweight and can be hand-washed without much effort. The bamboo surface comes treated with mineral oil, which can be renewed from time to time to maintain it. Just be sure to use food-grade oil. The bottom of the Quirky Mocubo has rubber feet that keep it from sliding around on your countertop. Owners have commented that this is a very nice feature to have indeed. Underneath the chopping surface are three hidden storage drawers. They open to store prepped items or waste peels. There is a little lip that keeps them from falling completely out if you need to move the chopping board. Or you can remove them and place them alongside the board while you work. See how to use the Mocubo in this video here. When you want to wash the board, you can completely remove the drawers for washing as well. The board measures 11 by 16 inches in size, just right for cutting all sorts of foods without hogging all the counter space. If you want to have an organized workspace in your kitchen where you can do food preparation, these chopping boards are the perfect solution. They give you plenty of room for cutting fruits, vegetables, and meat while providing convenient places for storing what you’ve chopped. Both the Quirky Mocubo and the Frankfurter Brett are great choices for people who love to cook. If it’s hard to decide between the two kitchen workbench systems, we understand. We like them both. But if you have to choose, consider the following. The Quirky Mocubo has a less comprehensive setup, but it’s also less expensive to purchase. It would be a good choice for someone who enjoys cooking and has tired of cutting boards sliding around on the countertop. The three storage drawers are large enough to hold prepared items for a small family meal. The board doesn’t take up much room but keeps things organized. It’s clearly a step above the usual chopping board. The Frankfurter Brett is much more customizable, down to the color of the brackets and the cutting surface itself. You can change the size and number of the storage containers. You can choose between three sizes of workbench. This system is ideal for a chef or a serious cook, someone who spends a lot of time preparing food. It streamlines the prep process in more than one way and is a very enjoyable tool to use. We hope this article helped you select a new kitchen gadget today that will make cooking even more enjoyable for you. Check back soon for more reviews of the best products that make life easier. Since we’re on the topic of wooden chopping boards, here are a few tips for safe food preparation at home. Wash your hands for 20 seconds with soap and warm water before handling food. Keep raw meat, fish, and poultry away from fruits and vegetables that you won’t be cooking with them. After cutting raw meats of any kind, wash your knife and cutting board with hot soapy water. If needed, you can sanitize countertops and utensils with a solution of 1 tablespoon of bleach mixed in a gallon of water. If you need to store what you’ve prepared, be sure to cover it and put it in the refrigerator promptly. I’m glad these have come up on my timeline again – love them, want them and when I get a chance will buy them! Cup I don’t use bleach. If I use a glass bowl to dip raw chicken into breadcrumbs and roll it around I don’t use bleach.